Self-promotion on the internet is chock-full of new tools, platforms, and buzzwords to keep us all on our toes. 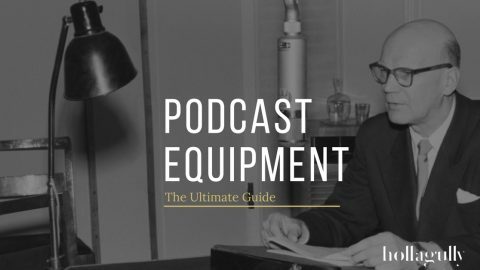 With new standards of promotion in podcasting, personal branding, live streaming, and content marketing, we’re all aspiring content machines looking to catch audience attention wherever it temporarily may be. What’s great about these new promotional activities is that they’re easy enough to do. 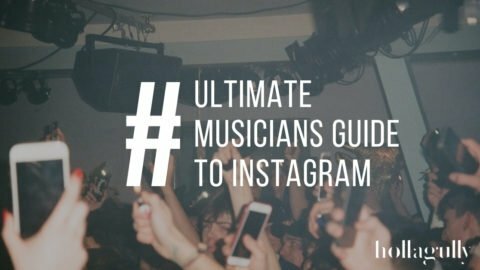 Whether you’re creating a personalized radio-style programme, or shooting an impressive video with your smartphone, your biggest obstacle will be to engage and maintain an audience. 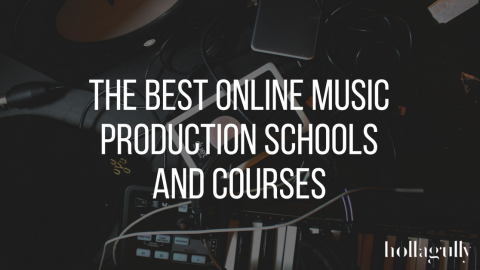 This means your efforts are not best spent on hours on end searching for the best USB microphone to do the job. This article will provide you with everything you’ll need to make an informed decision. The Blue Yeti USB is undoubtedly the most versatile USB microphone on the market right now and is adored for its durability, aesthetic, and simplicity. It is certainly geared toward vocal use and offers a rich tone that is complimentary to any vocal recording application. The Blue Yeti offers the choice between four polar patterns: stereo, cardioid, omnidirectional, and bidirectional. This makes it great for single, double, or multiple voice recordings, all with the turn of a knob. It’s constructed of metal and built with Blue Microphones renowned vintage aesthetic. Plug ’n play instantly with any recording device including Apple’s Lightning to USB 3 Camera Adapter with no need for drivers. The Blue Yeti’s features are straight-forward enough for anyone to understand. The face holds a mute and master volume control, a zero-latency headphone output is found on the bottom, and the rear holds a microphone gain control, and polar pattern selection control. And finally, mount the Blue Yeti on to a regular microphone stand when desired with its standard threaded mic connection on the very bottom. 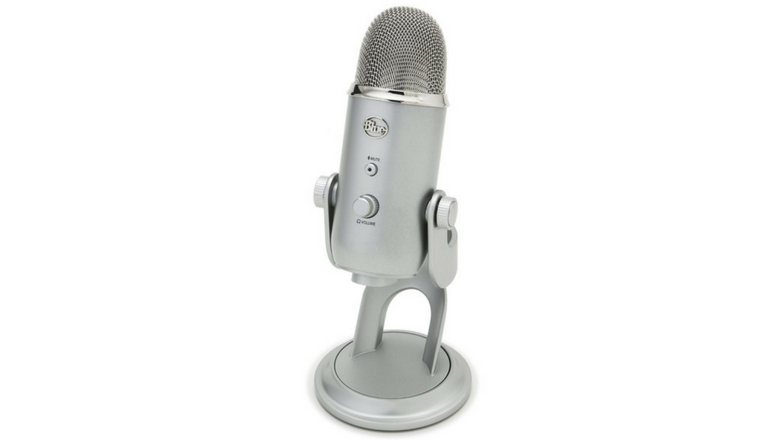 >> Read our full review of the Blue Yeti USB Microphone. The RODE NT-USB operates simply and is an excellent choice producers of multimedia, web content and music. It is powered via USB to any recording device and features a stereo headphone output for direct monitoring with an accompanying volume control. A second level control allows the balance of the mix between the signal from your recording device and the level going into the microphone. This will let you talk or sing along to existing music or audio and set the perfect balance in your headphones. The RODE NT-USB is durably built with a metal chassis and is a great travel companion. It comes with an attachable desktop tripod mount, a soft-storage case, a curved pop shield and a USB cable. There is a brightness in tone, making it ideal for vocal recording applications but it additionally serves well for demoing musical ideas also. It’s affordable, well-built, and comes with some essential accessories. >> Read our full review of the RODE NT-USB. For those looking for simplicity and reliability we suggest the Audio-Technica ATR2100-USB. 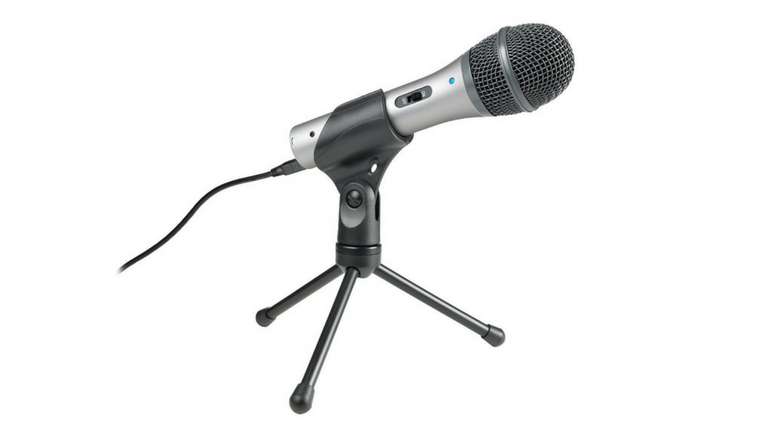 This is a cardioid dynamic microphone that is designed for vocal recording and offers a bright, vibrant character. Competitively priced, the ATR2100-USB is simple but differentiated in that it features both a USB and XLR connection. That means that you can also use it in live instances where the sound set up of the venue requires an analog XLR input. Great for keynote speeches, presentations, concerts and anything alike. The ATR2100-USB features a volume control, low-latency headphone input and a blue LED light that indicates when the microphone is turned on. It comes with a 10’ USB cable, and a mini desktop tripod stand. Very affordable, very practical, and very straight-forward. >>Read our full review of the Audio-Technica ATR2100-USB. Another no-fuss choice to make our list of best USB microphones is the CAD U37 cardioid condenser microphone that offers a warm response and attention to detail. This is a great choice for podcasters and YouTubers working from their desks. A -10db pad allows you to record louder sound sources without overloading the signal. So if you’ve got a lot of fluctuation in volume with what your recording this can be a good choice. A bass roll-off filter removes a lot of low frequency that this sensitive microphone is bound to pick up, such as passing vehicles or footsteps. It is not necessarily the most durable microphone as it is constructed of plastic but it by no means feels cheap. 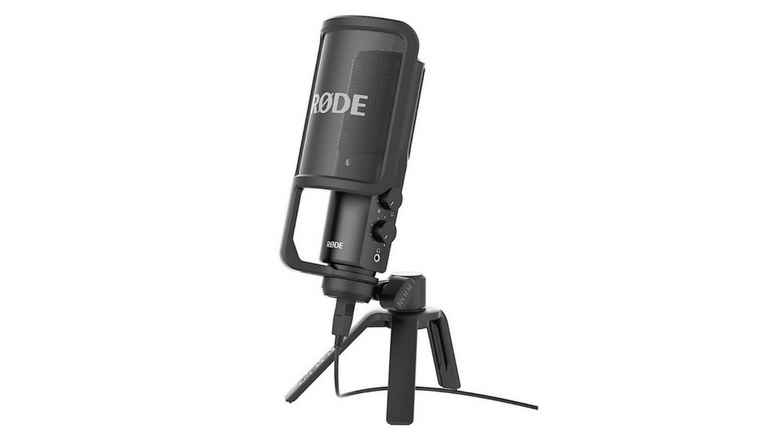 It comes with a desktop tripod stand but you’ll want to consider getting an additional pop filter to help tame unwanted pops and sibilance found in close up voice recordings. This additional purchase is definitely not a problem given the low price of the CAD U37. 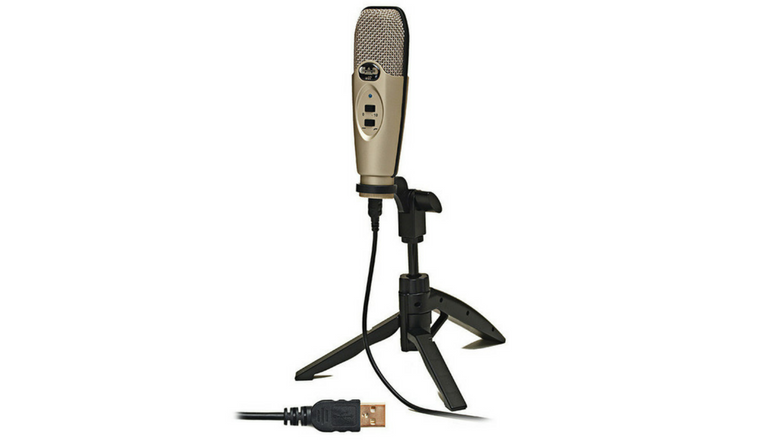 >> Read our full review of the CAD U37 Condenser Microphone. 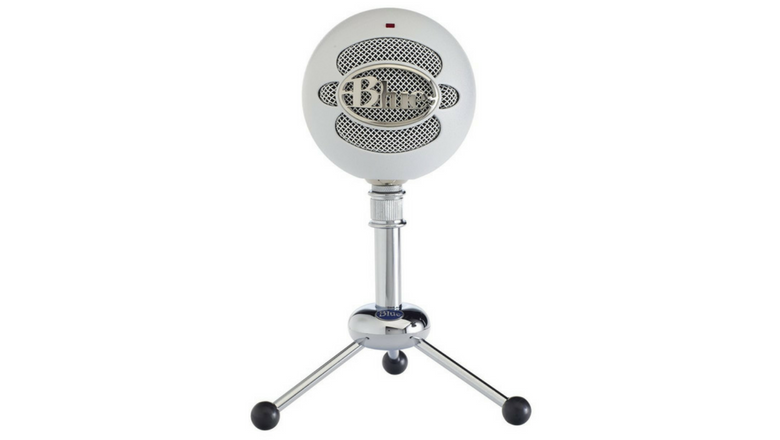 Blue Microphone finds itself on our list again with their Blue Snowball USB cardioid condenser microphone that is as retro as one would expect from Blue and high quality as well. This USB microphone is simple as they come and is a hit among podcasters, gamers. Though it is low-priced it captures a highly-detailed signal and is a great choice for all forms of homemade multimedia. There is a choice of two cardioid polar patterns for single voice recordings and an omnidirectional pattern offering a full 360-degree recording. These controls can be controlled at the back of the mic. The Blue Snowball USB is well-constructed and features a wire-mesh grill on both sides protecting the inner components. A threaded stand adapter allows you to connect it to either the included desktop tripod stand or a regular microphone stand for a different mic placement. >> Read our full review of the Blue Snowball. The Samson Meteor is a hit among multimedia creators on the go as it is very small and compact and picks up a great amount of signal. Connect it to any device, including the Apple iPad Camera Connection Kit and record anywhere you desire with ease. This is a perfect choice for podcasters, voice over artists, and gamers. Musicians often take this one on the road for demoing new ideas on the go. The Samson Meteor is as simple as it looks and only features a headphone input, a headphone volume dial, and a mute button. It is attached to three sturdy legs that keep the mic planted to your desktop with non-slip rubber grips to hold them in place. It can also be attached to a regular mic stand which is great for adding a pop filter into the mix. 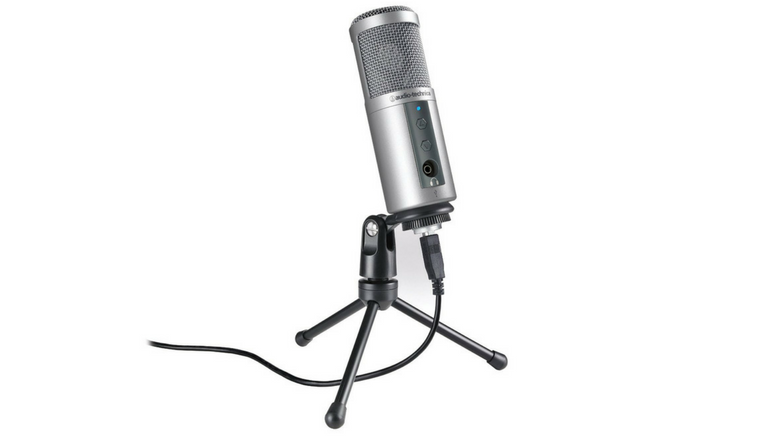 >> Read our full review of the Samson Meteor Mic USB. Customer satisfaction is very high for the Audio-Technica ATR-2500-USB. It records high-fidelity audio and is affordable for anyone looking to get to work with voice recording. 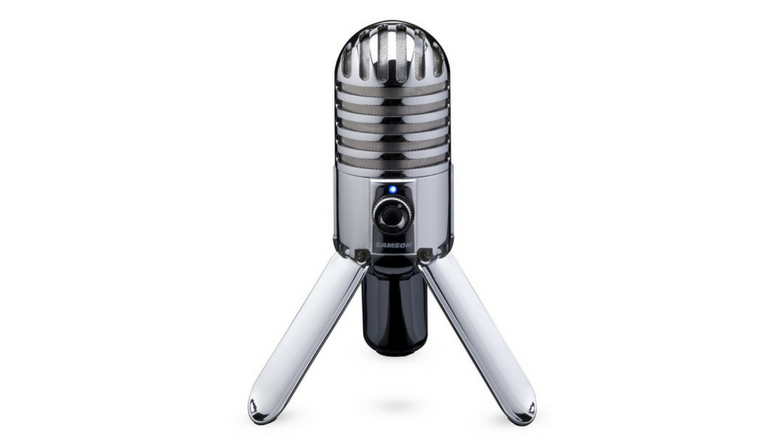 It’s a cardioid condenser microphone that works with any recording device and has a very workable tone for voice recording applications. It features a headphone plugin for direct monitoring to avoid delays during playback through your recording software. There are two buttons on the front to control the volume up or down and a blue LED light indicating it is plugged in. With the ATR-2500-USB you get a mini tripod desk stand, a USB cable and a pivoting microphone clip to hold it in place. This microphone doesn’t ship with a pop filter but it certainly makes up for it with a great sound and even better price. >> Read our full review of the Audio-Technica ATR-2500-USB. This is one of the worlds most iconic microphones. It is built like a tank, sounds fantastic, and it is affordable for any audience. The Shure SM58 initially only came with an XLR connection but Shure have now created the X2U XLR-USB adapter which allows you to connect to any recording device in a complete plug ’n play fashion. 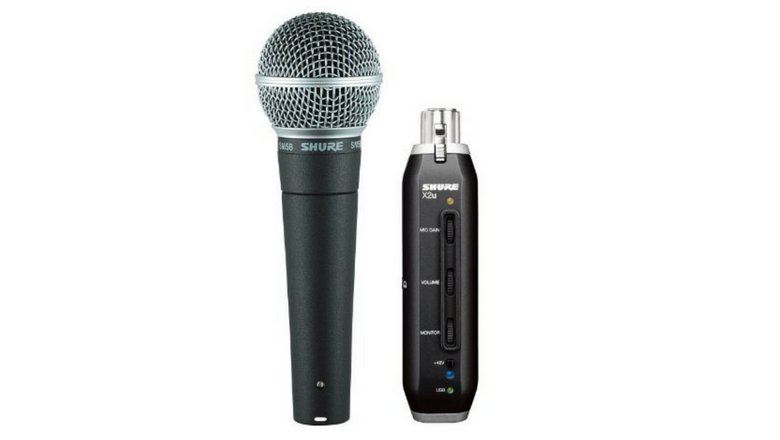 The Shure SM58 is a cardioid dynamic microphone designed for vocals. It is constructed to filter out pops and sibilance with its internal filter and to remove handling noise with an inner pneumatic shock mount. The X2U adapter features controls for gain, volume, monitor level, and a headphone output for playback. A great feature is that it has a +45V phantom power switch should you want to plug it into a condenser microphone in the future. >> Read our full review of the Shure SM58-X2U. What you’ll need to know in advance are all the applications you’ll be using it for—now, and in the future. Will you potentially be in unforeseen circumstances recording multiple people, musical instruments, a live presentation or Keynote speech…you see where I’m going with this? 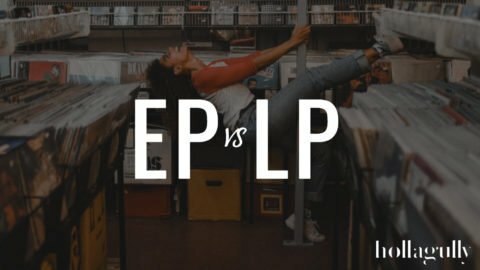 How feature-rich do you need your microphone to be and how much are you looking to pay for it? In this article we have provided a well-detailed list of the best USB microphones, some with plenty of features and some with little. But all of them are extremely easy to use and are viable for making radio-style recordings. 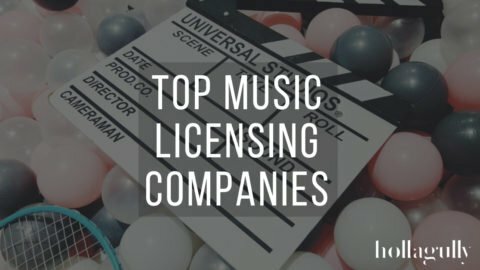 They are either constructed or come with accessories to make them ready for your desktop and will attach to your computer without the need for mic preamps or any other hardware. What’s more is they are very affordable with each model sitting under $200.00. This describes the microphones “directionality” or sensitivity to sound from various directions. Some microphones pick up sound only from one direction while others pick up from all or a combination of directions. We could beat this topic on the head, but we will only explain the polar patterns of the microphones listed below as they most fit for the functions USB microphones are built to perform. Bidirectional – Recording from the front and the rear of the microphone, bidirectional mode is a great choice when the microphone is shared between two people in an interview. Cardioid – Preferred setting for individual hosts on platforms such as podcasts, screen cast tutorials and webinars. Cardioid mode means it is focused directly in front of the microphone and captures much emphasis and character of the source. Very versatile microphones, ideal for general use. Very simply put, condenser microphones produce a highly detailed response which is great for recording vocals, acoustic guitars, and a variety of instruments in the studio. 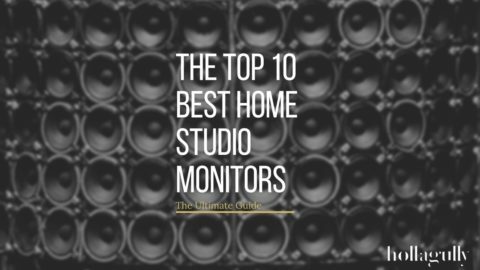 While this is great for audio professionals, their sensitivity can also make them somewhat of a nuisance for amateurs in general use as they tend to pick up a lot of background noise. Dynamic microphones are geared toward vocal applications, but also perform well on instruments. They are typically built it the cardioid polar pattern capturing audio from a single source, and being less sensitive than cardioid makes them great for recording loud audio while leaving plenty of headroom. This topic could be explained in much further detail, but if you’re in the market for a USB microphone under $200.00 than this information is not worth losing your head over. Just be conscious of your needs and look at them next to the features of each model. Well that about wraps up our USB microphone buying guide. Is there anything you feel we have left out? Let us know in the comments below what you’ve been using, what’s working for you, or what’s not?